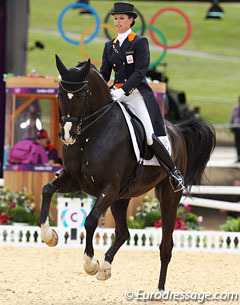 Scoring her ninth Olympic medal Dutch dressage great Anky Van Grunsven recently set a new world record as the only dressage rider to compete at seven consecutive Olympic Games. The 44 year-old was "delighted" with her London performance and says her equally wise and talented partner gave her everything he had! "I knew it would be the last time on a competition with Salinero. The main goal was enjoying our time together. Mission accomplished," she said. Scoring 74.794% in the Special and 82% to land in 6th place in the Kur, Anky was part of the bronze medal winning Dutch team. She says it was a pleasure to be amongst such great company. "Salinero and I did three amazing tests together. I’m really happy and proud that my eighteen-year old Salinero was still going strong." Van Grunsven savoured the thrill of yet another Olympic Games. "The atmosphere in the Dutch camp was perfect! I was really happy with all my teammates. We went to Eddy Stibbe’s yard one week before the Olympics and the atmosphere even then was really good." Anky says she really enjoyed the London experience and in particular a few special moments. "There was a very high level in London, with many good horses, but that Salinero did so well and winning team bronze was the best part for me. The great kur was a highlight as well." Lifting herself up to a stand-out 6th place after her musical performance, Anky once again showed her mastery in the Grand Prix final phase. "My horse and I have the ability throughout the Kur to transfer emotions to other people," she explained. With yet another solid performance from the Dutch Olympian, Anky is proud of her ability to rise to the occasion, but will not reveal if there is anything she has to work on. "My strength is that I am always good under pressure," she admitted. "As for my weakness, I don’t tell"
When asked about the judging in London, Anky replied that "I think we can develop it in a better way." Also a tough competitor in the reining ring, Anky will now allocate her time more evenly towards both the disciplines she loves. "I plan now to compete and train in both reining and dressage. I will compete more with my Quarter Horse Whizzashiningwalla BB and now that Upido has recovered from his injury, I will take him to a dressage competition when I feel he is again ready for it." Before she gets back into her two-pronged equine career, both Anky and her partner, Dutch team coach Sjef Janssen, will go on a well deserved break. "Just a small break though! I’m going to Mallorca for a holiday, with Sjef and the kids," she said. Set to retire her long-time friend and partnering Olympian, Anky says Salinero will always be top dog around the stable. "Although he is retired now, that doesn’t mean that we don’t work together anymore. Every morning he still is the first horse to ride. After that, he is going in the field." To the question whether she she will make that seven Olympics an eight, Anky replied "Time will tell!"